11 out of the 18 banks that operate in Cote d'Ivoire have shut down operations since February 14, 2011. The first ones to suspend operations were BICICI (branch of BNP Paribas), Citibank and Access Bank (Nigeria). Feb 18, Access Bank published the following press release: "Access Bank Plc, [...], the full service commercial bank with headquarters in Nigeria and operations across Sub-Saharan Africa and the United Kingdom, regrets to announce that it has had to suspend its operations in Cote d’Ivoire effective Monday 14 February 2011 [...]"
Then other banks suspended operations as well, among which the leading bank SGBCI (branch of Societe Generale). 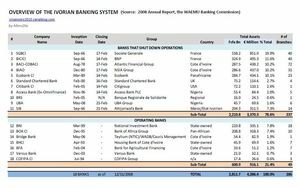 According to the WAEMU Banking Commission's latest report (as of December 2008), total assets of all banks operating in Cote d'Ivoire amounted XOF 2,811.7Bn ($5.7 Bn) ; banks that interrupted activities manage about 80% of this total. These banks are French, for the two first ones, Nigerian, Pan-African or Ivorian-owned. For most of them security of staff and difficulty in operating in this political context motivated the shut down, as stated by United Bank of Africa (UBA) in its today's press release "The suspension of operation in Cote d'Ivoire is consistent with our group staff welfare code given the current political situation in the country at the moment and the implication for the security of our employees. According to the Managing Director of UBA Cote d'Ivoire, Mr. Liby Guillamme, the suspension of the banking operations became more expedient following the political situation in the country that has made banking operations in the country non-sustainable at the moment." However remaining banks, that manage 21.4% of total assets, keep operating but for how long more ? It is more likely that these banks won't have enough resources to sustainably support the Ivorian economy and will have to follow the same way, i.e. to shut down operations. How could a banking system survive without its leading banks ? AU head of state panel arrived in Abidjan this afternoon and is supposed to release its recommandations by Monday 28. The panel includes the presidents of Chad, Mauritania, South Africa and Tanzania. President of Burkina Faso, Blaise Compaore, that is considered as a fervent supporter of Alassane Ouattara finally does not belong to decision-making panel, which should be a pros for a more neutral outcome. Should we expect a happy end from the AU mission ? Will both parties bow to these recommendations ? In the meantime, Cote d'Ivoire is having a hard time because of ban on its exports but also its detoriarating economic and social situation. In fact, prices for bare necessities such as rice and oil have been rising, which caused an increase in the shopping basket of what average Ivorian Household buys. Cote d'Ivoire economic strangulation is showing its effects. The current situation appears as highly tense. However, once a political solution will be fgured out, Cote d'Ivoire should still be able to rely on its natural resources (oil, gas, diamond, golden). For an economic recovery, the country will also have to strenghten its leading position as the world's leading cocoa exporter.